Everyman's Library, 50 Albemarle Street, London, W1S 4BD. Website Designed by Blade Design Ltd. 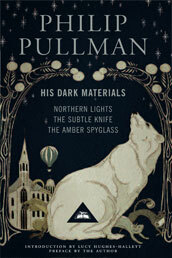 In his award-winning fantasy trilogy, HIS DARK MATERIALS, Philip Pullman invents a richly detailed and marvellously imagined world that is complex and thought-provoking enough to enthral readers of all ages. Northern Lights introduces Lyra, an orphan, who lives in a parallel universe in which science, theology and magic are entwined. Lyra’s search for a kidnapped friend uncovers a sinister plot involving stolen children and turns into a quest to understand a mysterious phenomenon called Dust. In The Subtle Knife she is joined on her journey by Will, a boy who possesses a knife that can cut windows between worlds. As Lyra learns the truth about her parents and her prophesied destiny, the two young people are caught up in a war against celestial powers that ranges across many worlds and leads to a thrilling conclusion in The Amber Spyglass. 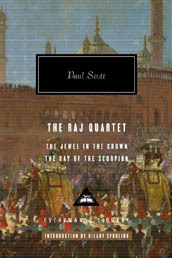 The epic story Pullman tells is not only a spellbinding adventure featuring armoured polar bears, magical devices, witches and daemons, it is also an audacious and profound re-imagining of Milton’s Paradise Lost. An utterly entrancing blend of metaphysical speculation and bravura storytelling, HIS DARK MATERIALS is a monumental and enduring achievement.